Go to any urban environment and it is hard not to notice the craze for the fixie bike. Once only popular with serious road riders, they are now seen as being the epitome of cool, and why not? There’s something harmonious about riding a simple down-to-earth fixed-wheel bike, the sensation of the bike being an extension of the body is second to none, and without the intricacies of gears and brakes to disrupt the flow of things, you could easily be forgiven for assuming an air of carefree nonchalance. The Paddy Wagon has been around for a good few years now, and despite being refined every year, it still manages to retain the ethos of what Kona set out to do in the first place. This was to create something with the benefits of a track bike plus build in a decent level of comfort, allowing you to ride it every day. Kona has a reputation for well-built bikes and this is no exception, the neat welding of the butted cromoly tubing is what we’ve come to expect from the brand. It’s nice to see some intelligent detailing — the mudguard bosses would easily support everything you wanted to carry if you add a rack. The double bottle bosses are a nice touch and encourage you to take the bike a bit further afield, and to top this off, there’s the pearlescent paint job, which amicably stands up to daily knocks. Kona could have opted for a carbon fork, but has stuck to steel; I suspect this was a money-saving option, but does keep in flavour with the rest of the bike. Components are a mixture of branded and unbranded parts. Nothing here stands out on its own, but all work perfectly well when put together. The wheels comprise orange Alex rims built on large-flange hubs; these are de rigueur on singlespeed bikes and are a deliberate throwback to their track influences, as are the dropped track-style handlebars. While some bikes in this category come with only one brake, the Paddy Wagon reassuringly has two (this is now a legal requirement if you’re not riding in the fixed configuration). In recent years, steel has been looked down upon when it comes to bike frames. With exotic materials becoming widespread, some people look at steel as a cheap alternative, but ask any frame builder what the most versatile material is regarding build properties, longevity, and ride feel and it’s still their firm favourite. It’s clear to see that Kona knows exactly what it’s doing and has created something a little bit special. Although no lightweight, the stiffness of the frame, fork and wheels makes for a crisp, responsive and rewarding experience, and it’s only the slightly longer wheelbase and relaxed angles that depart this from its track-specific cousins. But this is no eyeballs-out track bike, there’s a sure-footed reliability to it and comfort that only a well-designed steel frame can supply. Combine that with the versatile frame add-ons and it’s firmly in commuter/trainer territory. So what do you get at the end of the day? A solid, but nippy bike that can stand up to the year-round daily grind and easily soak up the worst the roads can offer. The build quality is reassuring and the components and wheels effortlessly support this. The dependable ride could be livened up with a decent set of rubber if you wish for something a bit more sporty. Despite the stiffness of the bike, you can quite happily rack up the miles with ease. Note this is the 2010 version though, so you better be quick to get your hands on one. Want something that looks über cool? Then check out this fine little Italian number. 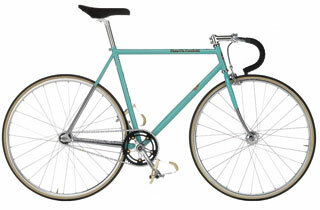 A true racing heritage mixed with classic retro looks make this one of the best-looking complete fixies you can buy, it’s exactly the sort of creation that you could find hanging on the back wall of a Shoreditch design agency. Beware though; fixed is the only way to go as there is no single-speed option and only one brake.